Entropion is the medical term used to describe an inward turning of the eyelid. Entropion is the medical term used to describe an inward turning of the eyelid. 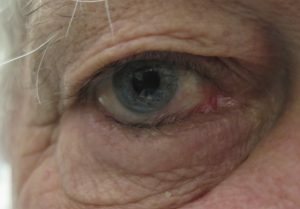 It is usually a problem that occurs in older age and mainly affects the lower eyelid except in the Developing World where a disease called trachoma causes the upper eyelid to turn inwards. This information sheet is about lower eyelid entropion. Entropion causes the lower eyelid lashes to rub on the surface of the eye leading to excessive tearing, redness, mucous discharge and irritation of the eye. There is also a risk of permanent damage to the surface of the eye. The lower eyelid can be held in the ‘out-turned’ position by sticking surgical tape on the lower eyelid/upper cheek. We will show you how to do this in clinic even if you are going to have surgery at will stop the eyelashes rubbing against the eye until the surgery. A couple of sutures (everting sutures) can be placed in the lower eyelid after injection of a local anaesthetic. These sutures hold the eyelid in the normal position for anything from a few weeks to sometimes as long as a year. Surgery is performed to reposition the affected lid. Normally a small incision is made at the outer corner of the lower lid and the loose structures stretched and shortened, then resutured to the tissue overlying the bone at the outer corner. Sometimes, another incision is made or additional sutures placed below the lashes to tighten the lower eyelid “retractors” which stabilizes the lid position. Occasionally, if scarring on the back surface of the lid is the cause of the entropion it may be necessary to place a graft of mucous membrane from the mouth or hard palate. The surgery usually takes between 30 to 60 minutes and is usually performed under local anaesthesia (numbing injections around the eyelid). Sometimes some sedation is also used to make you more sleepy and relaxed during the procedure. Very occasionally the procedure is done under general anaesthetic. It is usually a day case procedure is usually which means you can go home after the operation providing you are safe to do so. Blood thinning medications such as aspirin, clopidrogel (Plavix, Iscover) and warfarin can make bleeding more likely during and after surgery. Please tell me if you are taking these drugs and we will discuss if it is advisable to stop these medications prior to surgery. You might also consider stopping drugs including ibuprofen (Nurofen), fish oil, ginger, ginseng and garlic containing supplements 2 weeks before surgery. If you smoke it is preferable to stop or greatly reduce smoking at least 3 days prior and 1 week after surgery. This is important as smoking impairs wound healing and increases the risk of infection. It is probably advisable to avoid alcohol for a day before and a day after surgery. If you are having a local anaesthetic without sedation you can eat and drink up to the operation. If you are having sedation or general anaesthetic you must not eat or drink for six hours before the operation. On the day of surgery please dress casually and wear a top which buttons at the front. Please wash your face on the morning of surgery and ideally men should shave. Do not wear any makeup, jewellery or contact lenses. A pad is sometimes put on the eyelid and we will tell you when to remove this. If both eyelids are padded, one or both will be removed before you go home. Swelling and bruising is usual after surgery but can vary considerably. Factors associated with greater swelling and bruising include increasing age, the use of aspirin, warfarin or other blood thinners and a history of previous surgery on the same lid. The eyelid can be gently bathed with saline or cooled boiled water once or twice a day. Antibiotic ointment should then applied to the suture line and/or graft with a cotton-tip or clean finger. It can also be applied to the eyelid before showering or bathing to “waterproof” the suture line/graft. The wound area should be kept relatively dry until a couple of days after the stitches have been removed, i.e. it should not be soaked or submerged in water but it is fine for it to get splashed with water for example whilst in the shower. If it does get wet, gently dab it dry, but do not rub the wounds. Ice (crushed ice or frozen peas), cold packs, or cool gel face masks (available from most chemists) can be applied to the eyelid for 15 minutes at least 4 times daily for the first 5-7 days. This reduces lid swelling and bruising and can be continued for as long and as often as it seems to provide some benefit. About two-thirds of the bruising and swelling will have subsided by the first post-operative visit at one week. The remainder gradually subsides over the next several weeks and is usually invisible to others by six weeks. Your vision may be slightly blurred in the first couple of weeks while the lids are swollen: this will improve once the swelling settles. Severe pain is very rare after eyelid surgery – you should notify me immediately if you experience more than mild to moderate pain. Some eyes may feel dry or gritty for the first few days to weeks after surgery. This can usually be relieved with the use of artificial tear drops that you can buy from the chemist. You can use make-up the day after surgery, but avoid the areas with incisions or stitches. You can drive once you are happy with the vision and comfort in the eye(s), usually the next day. You should not drive if one eye is padded. You can fly on commercial airlines as soon as they wish to after surgery. It is sensible to avoid heavy physical activity (bending and lifting, digging, strenuous exercise) for the first week. Walking, reading, watching TV and light domestic duties can be performed when you feel able. Do not use aspirin or blood-thinning medications for the first 5 days after surgery unless you are already on them or we have discussed this prior to surgery. What are the main complications following entropion surgery? The lower eyelid may feel tender, bruised and swollen for a couple of weeks after the surgery. There may be some temporary numbness in the surrounding skin. The entropion may recur over time, especially if there is continued to be exposure to sunlight, and this would require repeat surgery. Infection is rare. The signs are marked increase in pain, tenderness, swelling and redness. Most infections can be easily treated with a course of antibiotics. Approximately 5-10% of cases have an asymmetrical appearance post-operatively. This often looks pronounced initially due to swelling and will settle. If it remains an issue then minor revision surgery can be performed. There is a tiny (less than 1 in 10,000) chance of visual loss with any eyelid surgery. We will give you a clinic appointment for one to two weeks after surgery when the skin stitches are removed. If you live far from the hospital, we may be able to arrange for removal of the stitches by your GP.